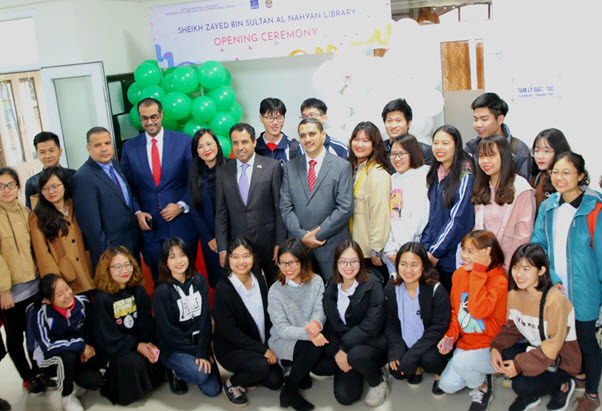 On March 18th, 2019, ULIS-VNU held the opening ceremony of Sheikh Zayed Library. 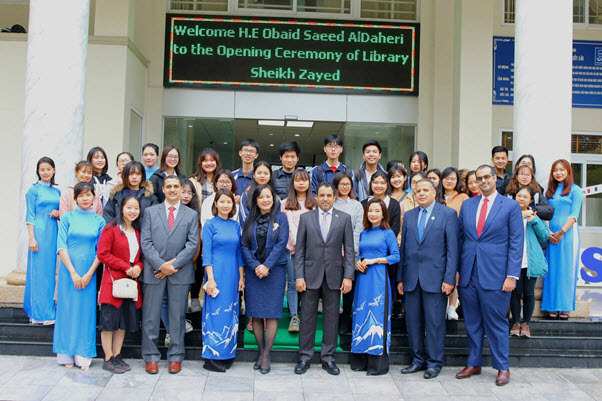 The library is located at Room 505, Block A1 and open with funding from the UAE Embassy in Hanoi to support Arabic teaching and learning activities at the University. This can be considered the first Arabic library in Vietnam. 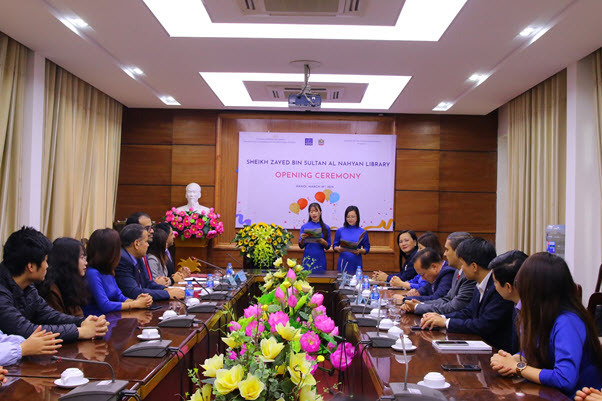 The ceremony was attended by Vice President Ngo Minh Thuy, Director of the General Administration Office Nguyen Doan Phuong, Director of the Cooperation & Development Office Do Minh Hoang, Deputy Director of the Politics & Student Affairs Office Nguyen Van Doan, Deputy Director of the Center for Information Technology, Communication & Learning Resources Duong Khanh Linh, Head of the Division of Arabic Language & Culture Le Thi Khuyen, lecturers and students of the Division of Arabic Language & Culture. On the side of the UAE Embassy, Ambassador Obaid Saeed Bin Taresh Al-Dhaheri and the officers of the Embassy attended the ceremony. On his congratulatory remarks, Ambassador Obaid Saeed Bin Taresh Al-Dhaheri affirmed the importance of education and the role of teachers. 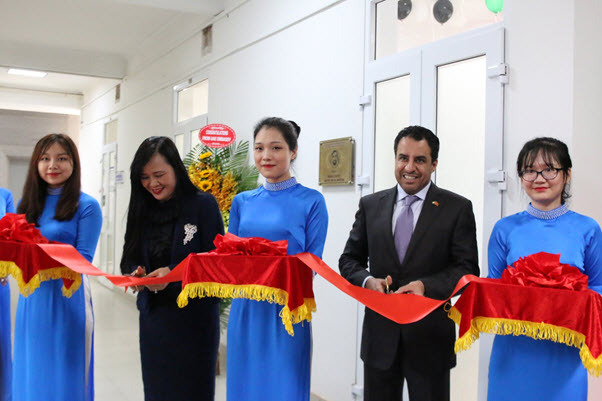 ‘UAE always supports Arabic language programs both at home and abroad, including Vietnam, the country has had diplomatic relations with UAE since 1993’ He says. 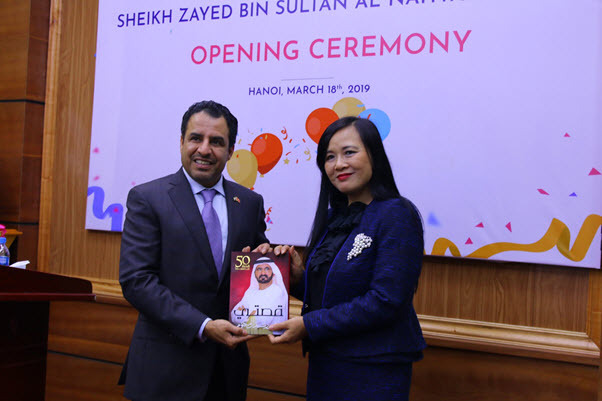 Vice President Ngo Minh Thuy believed that the opening ceremony of Sheikh Zayed Library would mark a milestone in the development of the Division of Arabic Language & Culture and could be considered the first Arabic library in Vietnam. 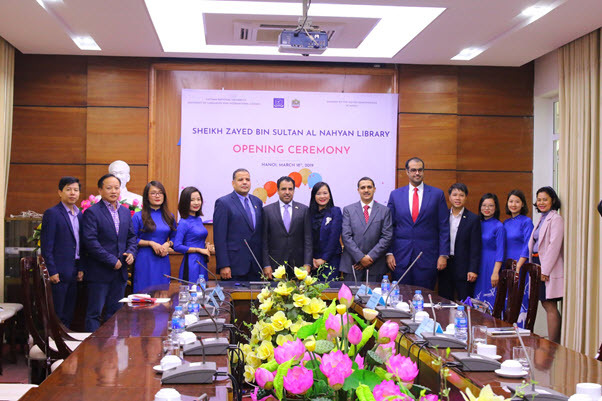 Later, Vice President Ngo Minh Thuy and Ambassador Obaid Saeed Bin Taresh Al-Dhaheri snip the ribbon, officially opened the Sheikh Zayed Library at ULIS-VNU.